A “skier’s thumb” is a common injury to the hand. Skier’s thumb refers to an acute injury to the ulnar collateral ligament (UCL) of the thumb metacarpophalangeal (MP) joint. This often occurs from a sudden, forceful deviation of the thumb, such as when the thumb is bent backwards or jammed. If this force is great enough, a ligament in the joint can be torn. This injury is referred to as a “skier’s thumb” given the frequency it occurs on the ski slopes. It may occur during a fall while holding a ski pole as the handle suddenly forces the thumb away from the hand. Of course, not just skiers get a “skier’s thumb”, as the injury is common in other athletes or people who fall on an outstretched hand. When injury to the UCL occurs after chronic, repetitive trauma, it can be referred to as a “gamekeeper’s thumb” in honor of the Scottish gamekeepers who often developed this condition. The thumb MP joint is primarily stabilized by the soft tissue structures surrounding the joint, specifically the ligaments and joint capsule. Ligaments are strong, fibrous tissues which connect bones to other bones. A stable thumb MP joint allows us to pinch, grasp, and use our hands effectively. 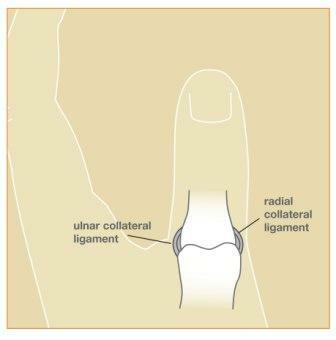 Without an intact ulnar collateral ligament, pinching with the thumb can be weak and painful. Opening jars, turning keys, and even light tasks can be difficult without a healthy thumb. The risk of degenerative joint disease (arthritis) is also increased when a joint is unstable. The diagnosis is made based primarily on history, physical exam, and x-rays. Most patients can report a sudden injury to the thumb associated with pain, swelling and possible bruising around the joint. Physical exam includes evaluation of the stability of the joint and possible injuries to the bones, joints, tendons, ligaments, nerves, and blood vessels in the thumb and hand. X-rays are helpful to evaluate for a fracture of the joint. Stress x-rays can be obtained in clinic if the stability of the joint is not clear on physical exam. During a stress x-ray, slight pressure is applied to the thumb to test the ligaments while the x-ray is taken. Rarely, ultrasound imaging or MRI can be helpful for diagnosis. The treatment plan will depend on the severity of the injury and the patient’s medical condition. Injury severity ranges from a minor sprain to a full-thickness tear of the ligament. This has been classified into 3 grades: grade I is a sprain of the UCL; grade II is a partial tear of the UCL; grade III is a full-thickness tear with joint instability. Most people have sprains or partial tears of the UCL (grade I or II). If the joint is stable on examination, surgery is not usually required. Treatment in these cases is typically rest and protection in a cast or full-time brace for 4-6 weeks. Activities are resumed as comfort permits, but forceful pinching is discouraged for about 3 months from the injury. It is very common to have some swelling and “aching” pain in the thumb for 6 months after the injury, particularly during strenuous activities. Some patients have injuries which are more severe and the stability of the joint can be compromised. When a full-thickness tear of the UCL occurs (grade III injury), healing of the ligament to the bone can be difficult. In many cases, the adductor aponeurosis tissue is interposed between the ligament and the bone. This condition is known as a “Stener lesion.” In other words, the ligament cannot heal properly because it is displaced too far and blocked from its natural position. Non-surgical treatment is unreliable in these cases. Surgery is usually recommended to secure the ligament back down to the bone. If there is an associated fracture involving the joint, treatment is decided based on the size and amount of displacement of the fracture fragment. Small, non-displaced fractures are often best treated non-surgically. Large, displaced fractures may benefit from surgery. The surgery is performed on an outpatient using either regional anesthesia or local anesthesia with sedation. During the surgery, I make an incision at the thumb MP joint, identify the damaged structures, and perform a strong repair of the ligament and joint capsule. In most cases, a bone anchor is used to secure the ligament to the bone. If there is a large fracture, this is stabilized using pins or screws. The radial sensory nerve, which provides feeling to the back of the thumb, is always in the surgical field. This nerve is identified and gently retracted out of the way during the procedure. If there has been a long delay in diagnosis – greater than 6 weeks or so – it may be difficult to repair the retracted tendon back to bone. In this case, local tissue can be used to augment the repair. In some cases, a tendon graft may be needed to reconstruct the damaged ligament. Therefore, early diagnosis and treatment are important. Your thumb will be protected in a plaster splint which will be removed in clinic at about 10-14 days. At this point, most patients are placed into a custom-made full-time splint or cast for an additional 4 weeks. I recommend avoiding heavy lifting, pulling, pushing or gripping for approximately 3 months after surgery. The ligament repair site requires several weeks to heal adequately. Unadvised use of the thumb before this time could compromise your result. The first 2-3 days after surgery can be painful and medications will be prescribed to help. Pain, swelling, and stiffness in the thumb gradually improve over time. Most patients can return to better function at about 3 months post-operatively, but maximum improvement can take 6 months or so. Recovery time varies among patients, depending on the severity of the injury, possible complications, and pain tolerance of the patient. Occasionally, patients have residual stiffness and “aching” in the thumb after treatment. Arthritis, also known as degenerative joint disease, may develop in the future if the initial injury damaged the joint surface. My goal is to help each patient obtain the most function possible after the injury.